The Falcone families are both deeply intertwined and deeply divided. Natalie, married to Theo once dated his brother Vinnie, with whom she later went into business and opened a restaurant. Both families had daughters of the same age, Arden and Rory, and these girls were more like sisters than cousins. Both families were living the American dream, comfortable and affluent, with successful children destined for Ivy League schools. Vinnie's bad investments cost the families the restaurant and their savings, and the girls had to scale back their educational plans and attend a less prestigious university. 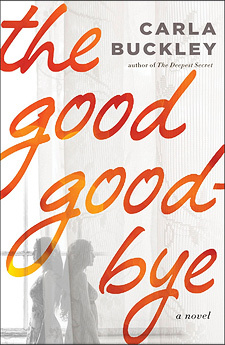 The Good Goodbye by Carla Buckley asks the question posed by all domestic thrillers - how well do we truly know the people we love? Arden and Rory leave the family homes and room together at college. Then the phone rings and every parent's nightmare comes true. The girls' room catches fire and they both jump from the window sustaining major injuries and burns. Told from multiple perspectives, we slowly learn why the girls' lives suddenly unraveled and who set that fire. This is an intricately plotted and suspenseful novel that forces parents to confront their closely held beliefs about their children.